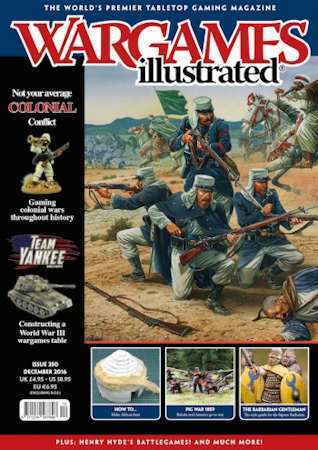 The December 2016 issue of Wargames Illustrated is available now. Our theme for this month's magazine is Not your average Colonial Conflict – Gaming Colonial Wars throughout history, and we begin our colonial coverage in Roman Britain, before taking in the 1670 Battle of Tangiers, The Pig War gone hot of 1859, The Anglo-Pedi War, and The Druze Revolt. We examine the new Team Yankee East German Intelligence Handbook Volks Armee, take a gloriously tongue-in-cheek look at the Barbarian Gentleman, present a How To… for making African Huts, a Rules Showcase of Dinoproof and plenty more besides, including in our Interactive magazine, a mini movie of some of the highlights of the recent Warfare show. OP is a new regular monthly feature in which Henry Hyde (with a little help from his friends) takes a look at what’s new and impending in the wargaming world. We begin our theme content with a classic(al) example of the art of colonialism, the Romanisation of a mysterious land full of tribal politics and pagan worship. Barry Hilton presents more on the Great Northern War, taking a closer look at the nations involved. King Charles II’s North African colony and the efforts taken to defend it from those who sought to oust the British presence, as presented by Pete Brown. The Battlefront studio present facts and ‘figures’ from their forthcoming Team Yankee German Intelligence Handbook: Volks Armee. A war that could have been, with information and ideas for gaming the same by Dan Mersey for his The Men Who Would Be Kings rules. A snapshot of the gaming life of the Maidstone Wargames Society, as taken by John Lambshead. Robert Giglio offers a decidedly different take on colonial-era Africa, with both the Boers and the British Empire taking turns to attempt to subjugate a tribal power. A small press set of wargames rules about larger than life heroes taking on dinosaurs great and small. Another different take on colonialism, this time recounting the tale of the French Foreign Legion versus the Druze Revolt during the interwar years. Paul Davies shows us how to create typical African huts for use in a variety of colonial and native settings. A look at the ideas and modelling options behind this game created by Phil Lewis which has been seen at a number of shows since its debut at Salute this year. Kenneth James provides a personalized look at why Konflikt ’47 has been added to his gaming repertoire. A gloriously tongue-in-cheek examination of the reality of ‘barbarian’ life and attire during the time of the Romans. Our new columnist and ex-Miniature Wargames editor Henry Hyde shares some of his thoughts on the social and sociable side of our hobby. Arima Harwood looks at re-creating these redoubtable warriors of Aotearoa in two different scales and for his favourite two WW2 game systems.